Blanchard No.18 36” Blanchard Grinder s/n 8128 w/ Direct Drive Spind le, 36” Electromagneti c Chuck, Coolant and Filtration. Thompson mdl. B 16” x 30” Automati c Hydraulic Surface Grinder s/n BBX738084-100813 w/ Electromagneti c Chuck, Wheel Dresser, 20” Wheel Cap, Coolant and Filtration. Jakobson mdl. GH1010 10” x 30” Automatic Hydraulic Surface Grinder s/n 16 w/ Electromagneti c Chuck, Wheel Dresser, Coolant and Filtration. Abrasive Tool Co “Hydrabrasive” 12” x 24” Automati c Hydraulic Surfa ce Grinder w/ Electromagneti c Chuck, Coolant and Filtration. Boyar Schultz Husk-E-Line HR818 8” x 18” Surface Grinder s/n 818-10210-HR w/ Wa lker Fine-Line Electromagneti c Chuck. 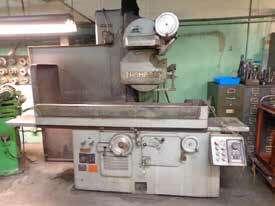 3) Boyar Schultz Challenger H612 6” x 12” Surface Grinder s/n 28084 w/ Wa lker Magneti c Chuck, Wheel Dresser. Toshiba mdl. ISE610W-33B 610 Ton Plastic Injection Molding Machine s/n 840206 w/ Toshiba Controls, 33oz Shot Size , 5-Heat Zones, 55” x 55” Platen s, 38” x 38” Between Tie Rods, Hopper Loader . HPM mdl. 450-1X-40 450 Ton Plastic Injection Molding Machine s/n 66-579 w/ HPM Controls, 40oz Shot Size , 4-Heat Zones, 43” x 43” Platen s, 27” x 27” Bet ween Tie Rods, Hopper Loader . Cincinnati 375 Ton Plastic Injection Molding Machine s/n 4003N32-5W-102 w/ Cincinnati Controls, 4-Heat Zones, 37” x 37” Platen s, 22” x 22” Bet ween Tie Rods, Hopper Loader . Cincinnati Milacron mdl. E/P PC III 250 Ton Plastic Injection Molding Machine s/n 4082A21/79-38 w/Cincinnati Controls, 32oz Shot Size , 5-Heat Zones, 38” x 38” Platen s, 27” x 27” Bet ween Tie Rods, Hopper Loader . Nat co mdl. 250HS 250 Ton Plastic Injection Molding Machine s/n250HS136 w/ Nat co Controls, 20oz Shot Size , 4-Heat Zones, 33” x 33” Platen s, 22” x 22” Bet ween Tie Rods, Hopper Loader . Nat co mdl. 250HS 250 Ton Plastic Injection Molding Machine s/n 250HS135 w/ Nat co Controls, 20oz Shot Size , 4-Heat Zones, 33” x 33” Platen s, 22” x 22” Bet ween Tie Rods, Dua l Hopper Loader s.
Platen s, 18” x 18” Bet ween Tie Rods, Hopper Loader . HPM mdl. 200-TX-14 200 Ton Plastic Injection Molding Machine s/n 66-203 w/ HPM Controls, 14oz Shot Size , 4-Heat Zones, 27” x 31” Platen s, 16 ½” x 16 ½” Bet ween Tie Rods, Hopper Loader . HPM mdl. 200-IX-14A 200 Ton Plastic Injection Molding Machine s/n 66-138 w/ HPM Controls, 14oz Shot Size , 4-Heat Zones, 27” x 31” Platen s, 16 ½” x 16 ½” Bet ween Tie Rods, Hopper Loader . (1991)Aratron mdl. EDM450 Die Sin ker EDM Machine s/n 011422 w/ Aratr on V-Puls MM77 Power Control Source, RSF Z525 DRO, 16” x 27 ½” Base Table, Wa lker 10” x 15” Fine-Line Electromagneti c Base Chuck, System 3R Tooling Head. Cincinnati Milacron Elektrojet 10E23 Die Sinker EDM Machine s/n 4107A1079-0020 w/ Cincinnati Solid State Cintrojet T IV-A 284S Dia l Power Source, 16” x 36” Base Table, Plat o 6” x 12” Magneti c Base Chuck, Cincinnati 2 ½” x 2 ½” Tooling Head. Cincinnati “Litt le Scotsman” mdl. DE EDM Machine s/n 41021V73-0007 w/ Cincinnati Cintrojet 142S Solid State Power Source, 12” x 20” Base Table, 5” x 10” Magneti c Base Chuck, 7” x 9” Tooling Base. Charmilles mdl. D400 EDM Machine s/n 4001 w/ Charmilles Isopulse P3 Power Source, 14” x 24” Base Table, Yua sa 5” x 10” Magneti c Base Chuck, System 3R Tooling Head. Lan sing mdl. G Large Bore 15” x 44” Geared Head Gap Bed Lat he s/n 20166 w/ 4” Bore Thru Spind le, 80-2000 Geared RPM, Inch/Metri c Threading , Tailstock, Tool Post, (2)16” 4-Ja w Chucks w/ 4” Bore, 12” 3-Ja w Chuck w/ 4” Bore. Frejoth type F1-900AE/G 12” x 36” Geared Head Gap Bed Lat he s/n 7332 w/ 70-1500 Geared RPM, Inch/Metri c Threading , Tailstock, KDK Tool Post, 8” 3-Ja w Chuck. Rambaudi mdl. M3 Vertical Mill s/n 15898 w/ 60-3000 RPM, 16-Speed s, FC-45 Taper Spindle, Power Feeds, 12” x 51 ½” Table, Coolant. (1999)Frejoth mdl. AM-2V Verti cal Mills/n 990828 w/ Ster ling DRO, 3Hp Motor, 60-4200 Dia l Change RPM, Chrome Wa ys, Power Feed, 9” x 42” Table. 4) Bridgep ort Serie s 1 – 2Hp Verti cal Mill w/ 2Hp Motor, 60-4200 Dial Change RPM, Chrome Wa ys, 9” x 42” Table. Bridgep ort Verti cal Mill s/n 110069 w/ Bridgep ort DRO, 1.5Hp Motor, 60-4200 Dial Change RPM, Chrome Wa ys, 9” x 48” Table. Lagun mdl. FTV-2S Verti cal Mill s/n 28475 w/ Acu-Rite DRO, 2Hp Motor, 60-42000 Dial Change RPM, Power Feed, 10” x 50” Table. Lagun mdl. FT-1 Verti cal Mill s/n 4928 w/ Sargon DRO, 2Hp Motor, 55-2940 RPM, 8-Speed s, Chrome Wa ys, 9” x 42” Table. Cincinnati No.2MI Universal Mill s/n 2J2P1Y-149 w/ Compound Vertical Milling Head, 242-2425 Verti cal RPM, 50-Taper Verti cal and Horizonta l Spindles, 25-1500 Horizontal RPM, Power Feeds, 10” x 52 ¾” Table. Deckel mdl. FP1 Universal Mill s/n 31871 w/ Compound Vertical Milling Head, 120-1200 Horizontal RPM, 190-1900 Verti cal RPM, Power Feeds, 10” x 23 ½” Table. ONLY. 14% BUYERS PREMIUM ON ALL PURCHASES.